The mixture of creativity and artistic talents, the field of Designing is divided into several sub-categories such as graphic designing and fashion designing but today we are going to talk about the scope, educational courses and professional career opportunities of another field which has recently received a boom in Pakistan. This field is Interior Designing that is described as the procedure of designing the interior of even exterior of different places which can be house, office, restaurant, theater, hotels and shops etc. 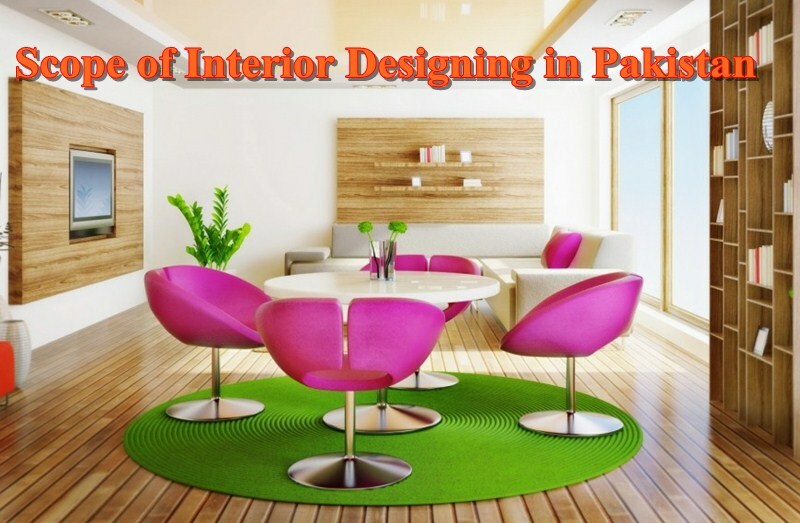 Although this field has been around of so many years but it has earned fame in Pakistan in just a couple of last years and with the people of our country becoming more trends and designs conscious, the demand of interior designing profession continues to grow rapidly and one can certainly expect it to increase furthermore in the coming years. By seeing peoples increasing interest towards this field, a large number of institutes have started to offer different degree programs as well as short courses of interior designing. Having a proper educational degree in even though not compulsory for a career in this field but having a degree always helps in increasing the chances of a bright professional career. In order to become a successful interior designer, there are some very specific skills that a person should posses otherwise gaining success in this field would become quite difficult. The first and undoubtedly the most important quality is to be creative minded so that you can look at things in a unique way which is the basic step for developing something new. In addition this, some other important that a person needs to develop are managements skills, communication skills, computer operating skills and finance managements skills etc. which are compulsory for running almost every type of business. When it comes to some specific skills related to this field, then knowledge about the building material, texture, lighting and trending architecture designs. As this field is quite new and growing rapidly in Pakistan so the future career opportunities are really huge. Although the best employment is always having your own business but one can also find work at various organization like architectural firms, government development department or hotels in order to polish their skills and gain work experience which will prove extremely helpful in the future. As one can start his own business as part time or even full-time while operating from home so this field also has an minimal investment benefit.